"Your kids will love eating this delicious snack as much as they will love to help make them." 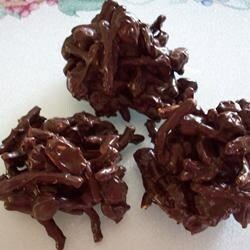 1In a large microwave safe bowl, microwave chocolate chips on high power, stirring every 30 seconds until smooth and melted. Stir in the raisins, peanuts and chow mein noodles. Roll into walnut sized balls using your hands and set onto waxed paper to cool. Chill or let sit until hard. Enjoy!